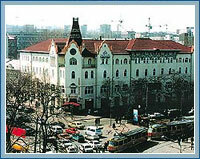 The five-star Grand Hotel Ukraine (4 floors, 69 rooms) was built in 1910 and reconstructed in 1997. It is located in the city centre in the business and cultural area, not far from the major places of interest. The Park named after T.Shevchenko, the Historical Museum and the Art Gallery are in 5 minutes by car from the hotel.